After a long Sunday moving, it feels good to get back to the sartorial side of life for a change. So, for your Sunday evening, a short shoe review. 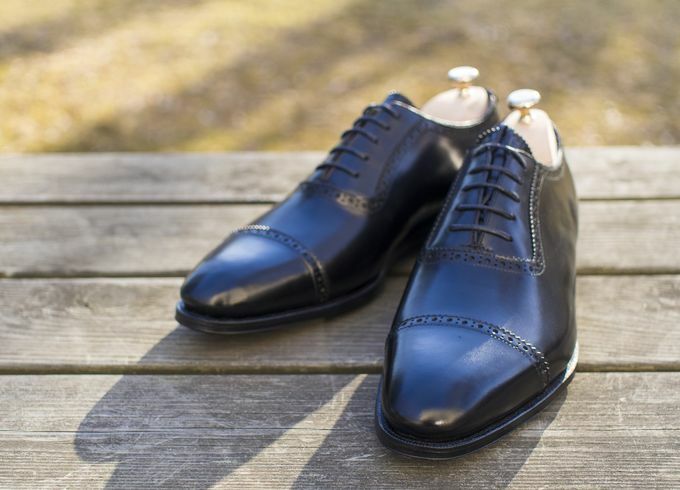 I've long been curious about Meermin's handwelted Linea Maestro line for a long time, and decided to get my next formal workwear pair from the currently available models. 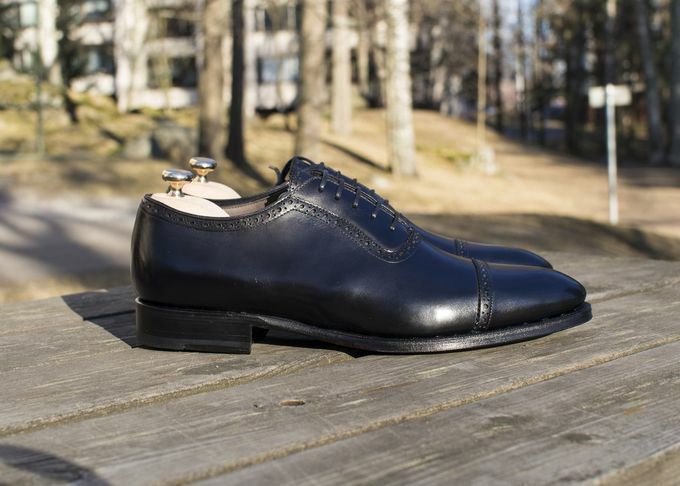 So, after some consideration I decided to go for the black Freuberg calf Adelaide cap toe oxford, model 102461. 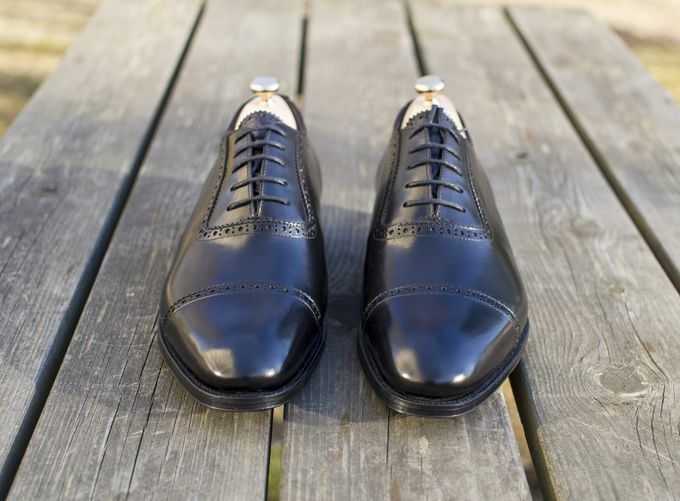 This particular model is lasted on the Olfe last and made from black Freudenberg calf. 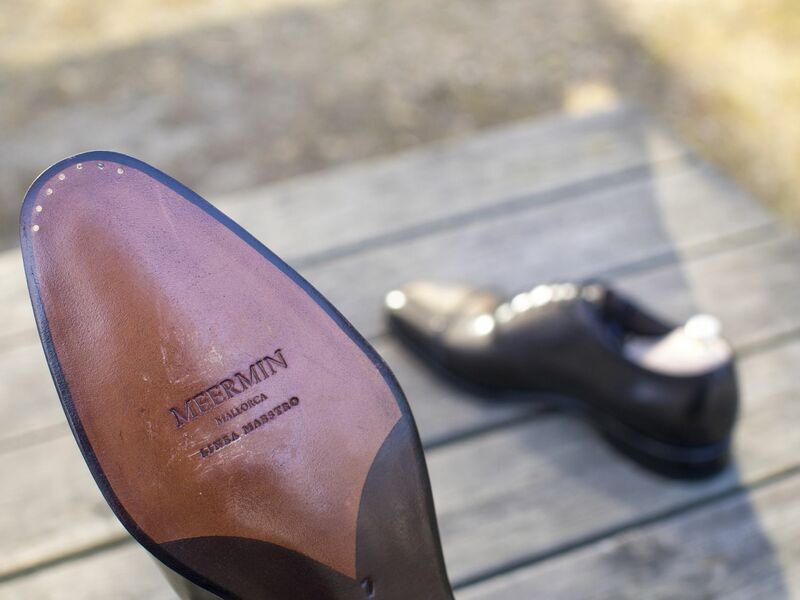 The model is also available in dark brown calf. This is the first time I'm seeing the Olfe last in real life, and it seems like a very versatile last. It's lower than Hiro and has some chiselling going on at the tip of the shoe, something that shows quite well in the pictures too. However, the shape remains fairly soft with some roundness to it. If you compare it to Hiro though, the lines are a lot more strongly shaped. When having the shoe in your hand, this is rather obvious all around the shoe, from tip to heel. Size wise these in UK 7 feel rather true to size (I'm wearing UK 7 is almost all my other shoes as well). Then, is the difference between these more expensive Linea Maestros and my regular Meermins obvious? The answer is pretty much a solid yes. The leather feels thicker and softer than in my brown calf double monks, for example. When compared to my other premium shoes from Crockett & Jones and Wildsmith, for example, the leather feels almost as good. Obviously these are still considerably cheaper than those. The finishing has been done with more care I would say. On a close inspection this pair was immaculate with simply beautifully stiched seams. Lastly, the pair came with two shoe bags instead of one and had spare laces. Personally, I think Olfe is the kind of last that is probably at its best when worn with rather slim trousers. I like the moderately chiseled toe and the curves on its waist area, while even the heel has a much more distinctive shape to it. Time will tell how the leather will age, but I have a good feeling about this pair. Expect to see some office looks with these soon.